A different type of Ad that you can use in Newspaper theme is the background ad. This does not only bring extra functionality but makes your pages appealing to future visitors. Moreover, when they click on your background image, the ad URL will open in the same page or in a new one, according to your preferences. Step 1 – Go to Newspaper > Theme Panel > Background Settings. 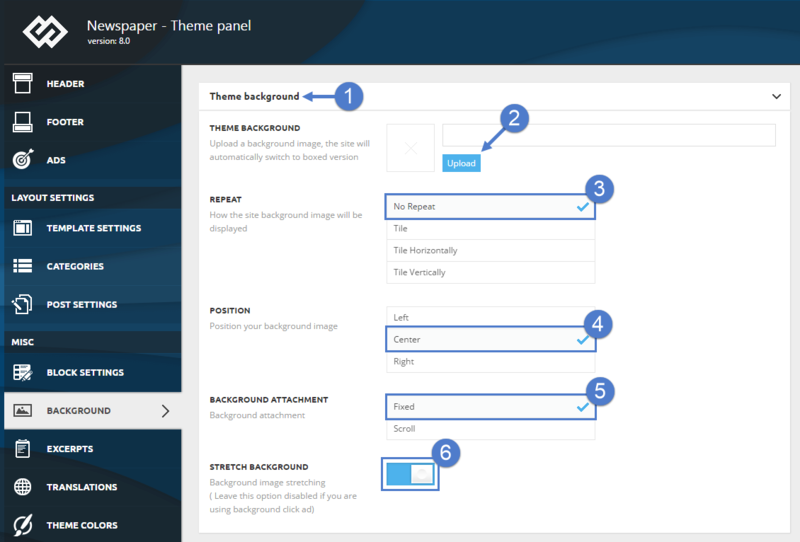 Step 2 -Upload your background ad in the Theme Background tab. Step 3 – In the ‘Repeat’ section, click on the ‘No Repeat’ option. Step 4 – Position your background image by selecting the ‘Center’ option. Step 5 – From the Background attachment, set the Background as ‘Fixed’. Step 6 – Go to Newspaper > Theme Panel > Ads, and open the Background Click Ad section. Step 7 – In the dedicated section, just paste the URL for the redirection page and Save the settings. Step 8 – The Newspaper theme allows you to open the ad URL in a new window. If you want the URL to be opened in the current page, leave the ‘Open in new window’ disabled. After you finished customizing your Background Ads, press the Save Settings button.